BANGKOK (REUTERS, AFP) - A motorcycle bomb exploded in a market in Thailand's southern Yala province on Monday (Jan 22), killing three people and wounding 22, a spokesman for the Internal Security Operations Command (ISOC) said. 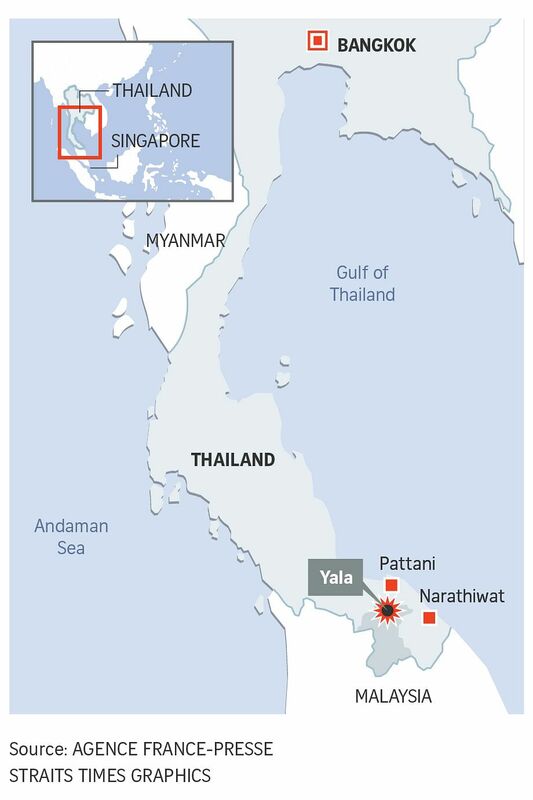 The mostly Muslim provinces of Narathiwat, Pattani and Yala in Thailand's far south are home to a long-running insurgency by ethnic Malay Muslims fighting for autonomy in which more than 6,000 people have been killed since 2004. "The criminals put a bomb in a motorcycle and placed it next to a market cart. The force of the explosion caused three people to lose their lives," ISOC spokesman Pramote Prom-in said. The ISOC is a government security force that operates in the region. No group claimed immediate responsibility for the attack on Monday, which took place at a roadside morning market. Chunks of torn corrugated roofing and parts of destroyed motorbikes and stalls littered a narrow alleyway in the market, as police picked through a scene of devastation shortly after the bomb. The region has seen hundreds of attacks since 2004, many of them deadly, but there had been fewer violent incidents of late. Analysts who monitor the conflict say violence from the insurgency fell to an historic low in 2017 despite the fact that talks aimed at bringing peace gained little traction. Thailand’s military government has tried to revive talks with rebel groups initiated by the previous civilian government, but they have gone almost nowhere. Resistance to Buddhist rule from Bangkok has existed for decades in the predominantly Muslim southern provinces, waning briefly in the 1990s before resurfacing violently in 2004.